Small Sources No.50. 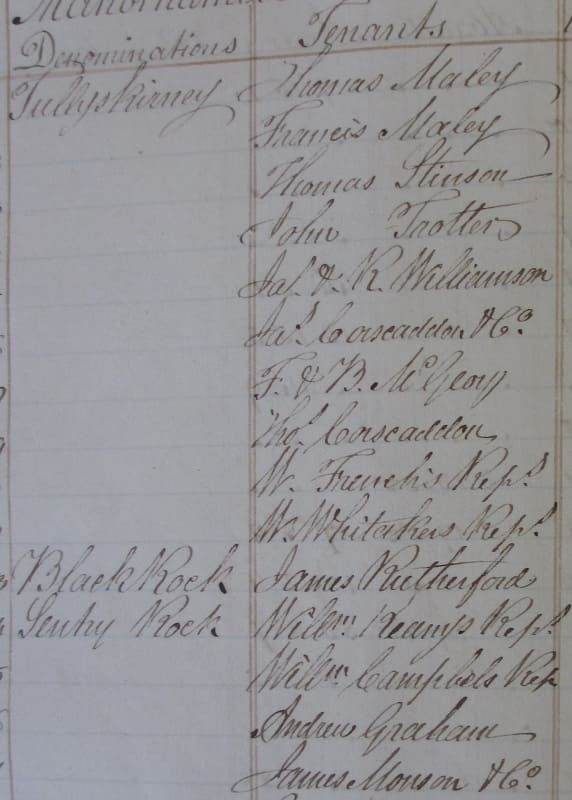 This is a list of 173 tenants on the Earl of Leitrim’s Manorhamilton estate in the period 1829-36. 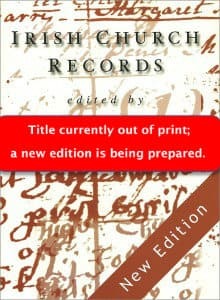 The original document (NLI Ms. 16,978) is in the National Library of Ireland among the extensive Leitrim Papers, which contain the records of the Clements family (Earls of Leitrim) from 1749 to 1946. 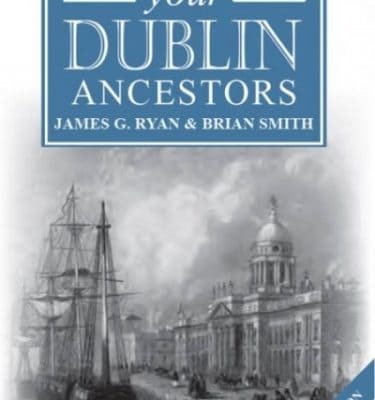 Other rentals we have published from this estate include an 1800 rental of Mohill, and also an 1829 rental from Bohey in neighbouring Carrigallen parish. Further information on the estate is in both of these blogs. Also, see our article here for a detailed account of rentals and their relevance. A map of this Manorhamilton estate is in the National Library and contains the above drawing of the town and castle. A contemporary account states that “the town consists of one long street of 233 houses, mostly thatched“. The rental below lists the ‘denomination ’, i.e. the property name first (by townland) and then the tenant(s). The properties are mainly in the Civil Parishes of Cloonclare and Killasnet. ‘Do.’ (an abbreviation of ditto) means ‘the same’ indicating that the tenant or property is the same as that above. The more commonly used versions of the townland names are indicated in brackets where the stated name is not the standard spelling. Note also that ‘tenement‘ in this context simply means a holding and does not have its modern connotation. The properties noted as tenements are probably within the town of Manorhamilton. 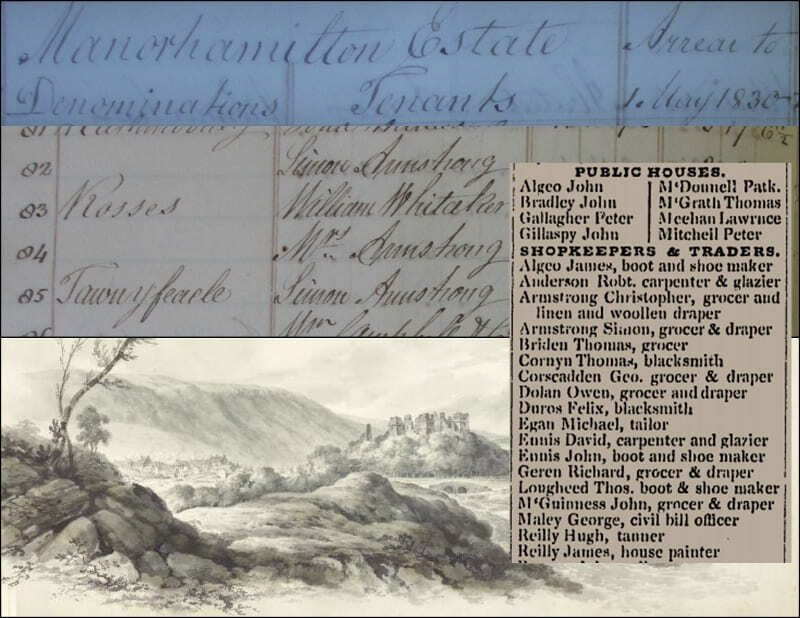 An extract from Slater’s 1846 Commercial Directory above shows several of the tenants as proprietors of businesses in the town. Whereas the above-mentioned Bohey estate rental is mainly ‘planter’ families ( i.e. those who came to Leitrim as settlers from England or Scotland) this rental contains more Gaelic/Norman tenants such as Maley, Carroll, Feely, Cullen, Gaffney and Meehan etc., all of which are relatively common in this region. Information on the occurrence of names can be found in John Grenham’s wonderful website. 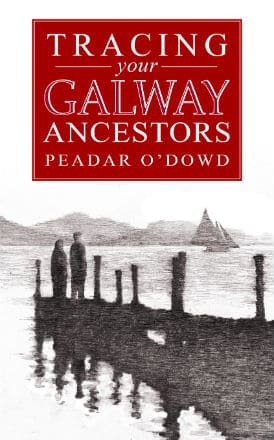 There are also some interesting rare names including Corscadden, Algeo and Porteus all of which are only found in Donegal and/or Leitrim; and Runnian and Isdal which are extremely rare in Ireland. Among the rare Gaelic/Norman names there is Gallanagh which is mainly found in Donegal. Ancestor Network will offer 1 free hour of research by a professional genealogist to conduct further research on these individuals or others in these estate papers. Click here and quote ‘Leitrim SS50’ in the subject line. 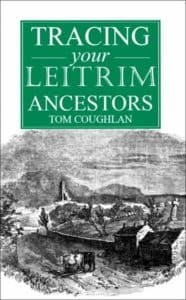 We also publish ‘A Guide to Tracing your Leitrim Ancestors’ by Tom Couglan – available here. J I Cullen & Co.
L Armstrong & Co. ? Extract from Ms. 16,978 courtesy of National Library of Ireland. 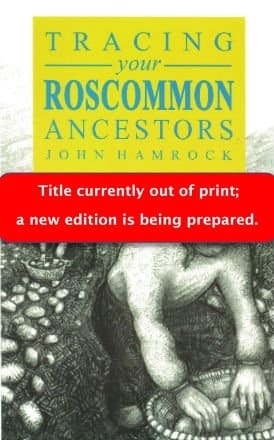 A Guide to Tracing your Leitrim Ancestors, by local genealogist Tom Coughlan is available here.